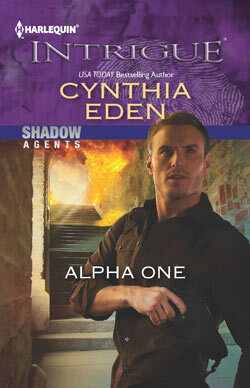 Happy Release Day to Cynthia Eden for Alpha One! She is having a Twitter Party tonight (January 2) so check out all the details here and sign up for several giveaways/prizes ahead of time! The minute he got the message, undercover agent Logan Quinn sprang into action. Getting Juliana James out of Mexico alive was the Elite Ops covert agent’s only priority. But once the senator’s daughter was safely back in their Mississippi hometown, Logan had a new mission: to get another chance with the woman he couldn’t lose again. Juliana had never forgotten the day, ten years ago, when Logan left her heart in pieces. Now he was back in her life, sworn to protect her from the ruthless weapons dealer who wanted her dead. As passion blindsided her–and she was once again thrust into danger–Julie realized how much she’d risk for one more day in Logan’s arms. Juliana is the daughter of a Senator who is not on the up and up and is working with a weapons dealer (Diego Guerrero). After the Senator lost his wife, he became lost and started dealing in weapons to make some extra cash on the side. Unfortunately he was skimming off the top and gathering evidence against the Guerrero. That didn’t make Guerrero happy at all and being the ruthless person he was known as, he wasn’t going to stand for it. So, what means the most to the Senator? Juliana. The Senator calls in the Elite Ops Division to rescue her. Little did he know Logan Quinn (someone he did not want in Juliana’s life before) was part of the EOD that would be on the mission, but he was desperate to get his daughter back. The adventure begins at the beginning of the book and doesn’t end until the last page. Logan Quinn is a hero with a lot of confidence but also self doubt. It seems from the beginning of the story all he does is lie. Some of it is his choice, some comes from direct orders. Boy does he dig himself a deep hole where Juliana is concerned! Juliana James doesn’t have a good relationship with her father, Senator Aaron James. Not after her mother died and he stared dealing in weapons. She has no idea why she is kidnapped because she has no information on her father. She quickly learns why she is the target and does her best to help the EOD protect her and bring Guerrero down. The plot in this story had the expected twists and turns that Cynthia writes but allows you to keep up and not feel lost. The romance part of this story fit very well. Logan and Juliana were together 10 years prior to this rescue mission so the reunion and time it took for them to be together emotionally again was appropriate and believable. There were a lot of lies between them and they had to get past those first. I enjoyed the supporting characters, specifically Jasper, and look forward to more stories about the EOD. If you are looking for a romantic suspense book, which is heavy on the suspense but would also like a happy ever after and is hard to put down, I highly recommend Alpha One! You can purchase it at Amazon or Barnes & Noble. Do you think there is ever an appropriate time to lie to a loved one? Cynthia’s book sounds exciting! I’m going to pick this up. Great review!